What Can You Expect From A Visit To Greatmoor? There is no charge for visits to Greatmoor, all you need to do is get here! During your visit your class may work in up to 3 rotating groups, maximum of 45 pupils. Each group will take part in three activities on a rotational basis. The visit will comprise of a tour of the facility and activities investigating waste reduction, reuse and recycling in the Visitor Centre. The tour includes visits to the Control Room, grab crane and waste bunker and the grate (including a view of the fire through the viewing hatch). The site tour will be led by the Education Manager. The other activities will be led by school staff – however the Education Manager will run through the activities with you during a pre-visit. Details of the activities will be agreed beforehand and explanations of the activities and can be found on the schools resources page or will be emailed to you in advance. All participants (both child and adult) will need to wear PPE during the site tour. This will include Hi-Viz tabard, Hard Hat, Gloves, Glasses and Steel Toe Cap Boots. All of this ppe is provided for visiting groups. Anyone unwilling to wear these items will unfortunately not be allowed onto the plant. “The Year 5 and 6 children have fed back that they really enjoyed the repackaging activity. All the adults supported this, were very impressed with this activity and said it was pitched perfectly for Upper Key Stage 2. Year 3 and 4 really enjoyed the waste sorting activity and I felt that the questions for them to think of were brilliant. This engaged the children and focused their learning. 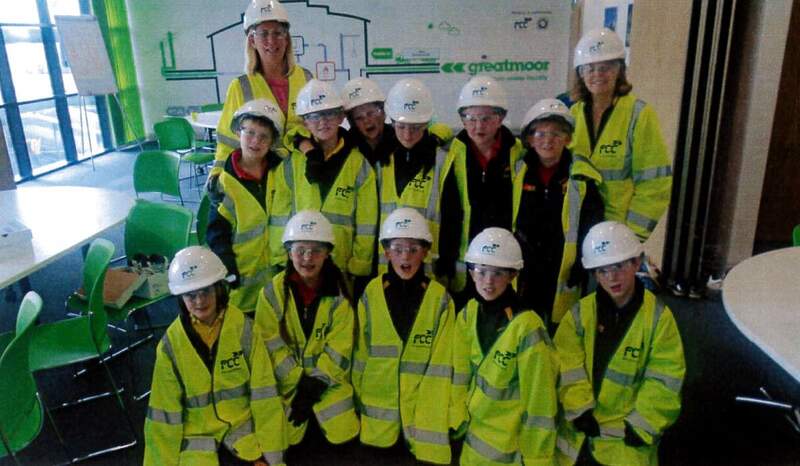 A Year 4 group from Beachborough School visited on 4th May. They saw the grab cranes working in the waste bunker and loading the waste into the hopper. They then visited the grate and the condenser fans. 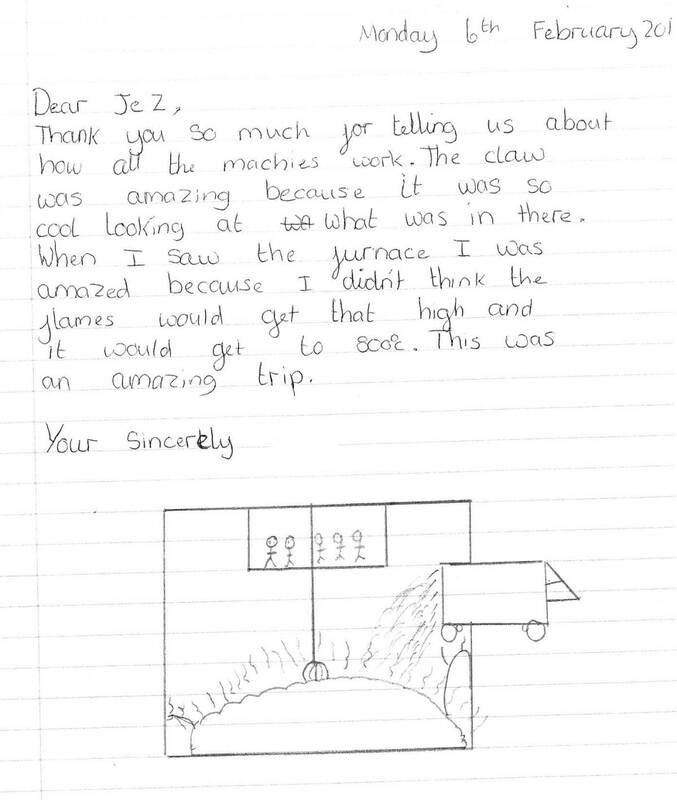 A report of their visit was included in their school newsletter. Re-imagining Packaging – Is packaging necessary? What is it for and can it be reduced? How can you minimise packaging? Bag House Filter Challenge – A short teamwork activity. Can you put together and dismantle a bag house filter as quickly and smoothly as possible? Waste Free Lunch Challenge – Lunchtime can be the source of waste – crisp packets, clingfilm etc. Can your class create a waste free lunch? Energy From Waste – Can you recreate the energy from waste process? Unmixing Your Recycling – Household mixed recycling goes to a Materials Recycling Facility where it is sorted (mostly) automatically. Can you work out how it does this, using cardboard tubes, a magnet and a torch? It is essential that the lead teacher makes a preliminary visit to the facility to meet the Education manager, undertake risk assessments, site inductions and finalise plans for the day.